They say good things come in small packages, and that's the case with the Dell XPS 8500. The system is only 16 inches high by 6.9 inches wide by 17.2 inches deep, but performs almost as well as a behemoth gaming system. Though it has a sleek design, its cover doesn't hint at anything special about this Dell machine. However, it must have some way to justify its $1999 (as of June 20, 2012) price tag. When we looked a little closer and pushed it to its limit, that justification became much clearer. 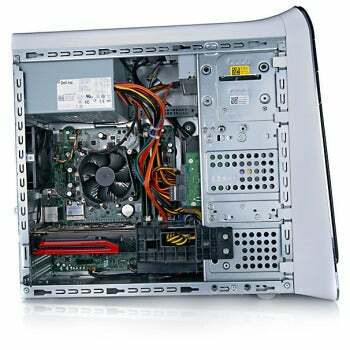 It comes packed with a new Intel Core i7 3770 Ivy Bridge processor with a stock speed of 3.4GHz. If that's not enough, it can easily push up to 3.9GHz using Intel’s Turbo Boost Technology 2.0. Intel is consistently putting out strong numbers with every processor iteration, along with greater power efficiency. This combination blurs the lines between performance and casual or business machines. Still, at nearly $2000, this is no budget system. The packed interior of the Dell XPS 8500. The pleasant surprises don't stop with the CPU. Supporting the speedy processor is 16GB of DDR3 RAM and some of the best storage I’ve seen in any system. The drives are a single 256GB SSD (no messy RAID) for the OS and programs, plus a 3TB 7200-rpm hard drive to hold vast volumes of data. It is rare to find such an abundant amount of fast storage on a machine that looks like it can barely fit in the basic components. But Dell somehow manages to squeeze everything in, hiding the SSD in a deep, dark cranny that’s nearly impossible to reach without disassembling the entire system. Normally, in a small case such as this, you would expect a small video card and sometimes, heaven forbid, an integrated graphics setup. But in the XPS 8500, Dell has managed to fit in a full-sized ATI Radeon HD 7870 graphics card with 2GB of GDDR5 memory on board. When put through our WorldBench 7 benchmark (more on those results below), it ran Crysis 2 and Dirt 3 on highest-quality settings at 2560 by 1600 resolution. This is enough to make most computers sweat, stutter, and die, but the 8500 put up some quality numbers. It managed an average of 25.6 frames per second on Crysis 2 and 44.1 frames per second on Dirt 3. At 1920 by 1080 resolution with detail levels set to high, Crysis 2 ran at 67.5 fps—well over the 60 fps needed for immersive gameplay, and the game still looked great. With all of these powerful amenities, the Dell XPS 8500 scored a very impressive 182 on our strenuous Worldbench 7 test suite, making it 82 percent faster than our baseline system. This puts it in good standing with other performance machines, especially the ones around the same price. If you want a machine that breaks the 200 mark, expect to pay anywhere up to two or three times the price of the XPS 8500. Of course, there are exceptions (see below for one of them). To make this even more of a versatile machine, the XPS bundles a comprehensive card reader, a Blu-ray optical drive, and an internal Wi-Fi adapter. These components add up to a great media machine. Transfer pictures quickly, watch your favorite high-definition Blu-ray movie, or stream your favorite video service wirelessly with this system that fits comfortably under any desk or entertainment center. Plus, it has plenty of ports to connect all necessary devices: six USB 2.0 ports (four on the back, two on the top) and four USB 3.0 ports (two on the front, two on the back). Finally, the included wireless keyboard and mouse are a welcome, if basic, addition. Everything points to a great machine to hook up to the family television. Rear view of the Dell XPS 8500. Even with all of these great features, the system, when opened, is a bit underwhelming. The wires are bundled neatly, and everything is tightly packed in a highly organized fashion, but it still looks like a business center system. The plain, gray 460W power supply is not modular, so the multicolored wires pour out of it in one large bundle. And the machine has no front- or side-panel fan to draw air in for extra cooling, something that may become necessary with a beast of a graphics card. Everything is so tightly packed that it is impossible to tinker with—you just don't have much space to add anything new. A couple of internal drive bays and PCIx1 slots are about it. The XPS 8500 has stiff competition in the Origin Chronos (priced at $1399 as of 4/2/2012), which scored a 204 on our Worldbench 7 tests and maintained a higher average frames-per-second rate on games. The kicker is that it's smaller, too: 13.82 inches high by 7.5 inches wide by 8.75 inches deep. 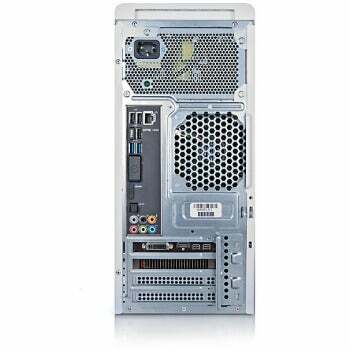 However, the XPS 8500 does offer a newer-generation CPU and substantially more storage. Overall, the Dell XPS 8500 is a great machine for a family that has both serious and casual computing needs. It is multifunctional enough for the gamer, the artist, and the movie buff. It will fit just about anywhere and looks so inconspicuous that it is bound to fade in the background of a living room, unlike the large glow-in-the-dark power machines I personally love so much. It's a near-perfect media machine and well worth considering at this price. The Dell XPS 8500 manages to keep a low profile while being a great gaming or media system.